Applications are invited for engagement of Two Senior Research Fellows (SRFs) in the project entitled “Valorization of industrially produced soybean and groundnut de-oiled meals/cakes by extraction, purification and production of protein isolates” funded by National Agricultural Science Fund (NASF), New Delhi. The appointments will be purely temporary under contractual and co-terminus basis, following the prescribed procedure for six months or till the completion date of the project. The appointments may be terminated at any time without notice or assigning any reason thereof. 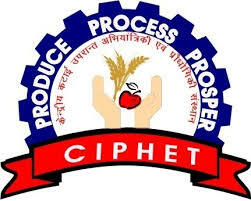 The candidates possessing required qualifications given below may appear before selection committee at ICAR-Central Institute of Post-Harvest Engineering and Technology (CIPHET), PO: PAU, Ludhiana-141004 (Punjab). Date and time of Interview: August 18, 2018, 11:00 A.M.
b) Essential Qualification Master degree in Food Technology / Food Science & Technology / Microbiology/Agricultural Microbiology /Industrial Microbiology/ Biochemistry / Plant Biochemistry/ Agricultural Biotechnology/ Dairy Technology/ Dairy Microbiology/ Dairy Chemistry/ with 4 years / 5 years bachelor`s degree having Ist Division or 60% Marks or equivalent overall grade point average. Candidate having post graduate degree in basic sciences with 3 years bachelor`s degree and 2 years Master`s degree should have NET qualification. c) Desirable Qualification Exposure to conducting basic studies on protein isolation, membrane filtration and microbiological analysis.